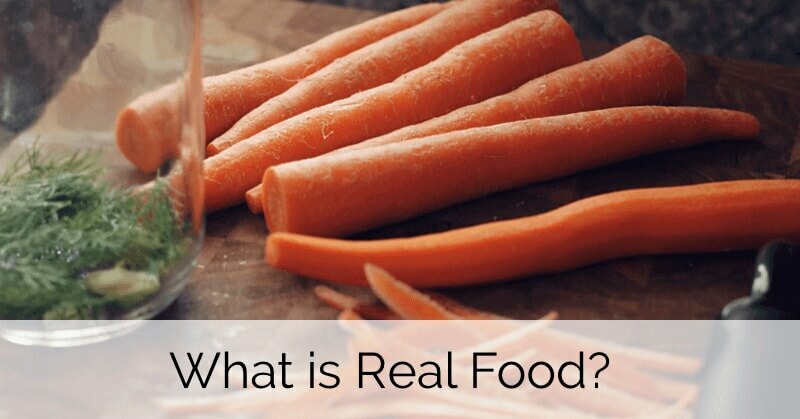 Home » Start Here » What is Real Food? Oh Lardy thinks most of us have a SAD diet! The Standard American Diet (some call it the Standard Westernized Diet…but SWD isn’t quite as catchy as SAD) is a diet that is high in overly processed, nutrient deficient ingredients. These products are high in refined sugars, refined flours, trans-fats, refined sodium, and are loaded with chemicals. Many scientists are linking SAD to many of the chronic health problems of our time such as diabetes, heart disease and cancer. We are eating ourselves into an early grave and it is not all our fault! Most of the food choices available in stores are fake food products, loaded with calories for energy for human survival but completely stripped of nutrients to nourish the body. You can overcome the SAD diet by searching out REAL FOOD!!! Real Food can be defined in numerous ways. Real Food is food as close to its natural state as possible. Real Food does not have artificial flavors, colors, chemical preservatives or genetically modified ingredients. Real Food is food that your great grandmother would recognize as food. Real Food does not have a long list of ingredients that you can not pronounce. Real Food provides nutrients and nourishment for our bodies. Food that has been created in laboratories has been so highly processed that it has been stripped of the nutrients that nature gave it in the first place. Sure these ‘fake foods’ deliver the calories we need to survive, but these food items are sorely missing the important macro and micronutrients that help our bodies stay healthy over the long term. Of course, it would be nice to have everything made from scratch in your own kitchen. It would be a treat if we could walk outside our door, fetch some fresh eggs, fresh vegetables and some fresh milk from a cow, however that’s not very practical (or even desirable) for many people. We live in a world where we buy food from large grocery stores and eat at restaurants. We are busy people with jobs, families and activities. This website will teach you how to find Real Food in your own communities and how to scout out Real Food from edible food substances in your own grocery stores! You can choose to go as ‘Real’ as you would like, as is practical and is friendly to your particular budget. That might be farm fresh everything or packaged food made with Real ingredients! Any step you take towards eating Real Food is a step in the right direction!!!! Choose whole food, 1 ingredient, when possible. Fruits, vegetables, eggs, etc. Try to buy organically grown, hormone free, antibiotic free, etc. as you can find and your budget allows. But remember, conventional fruits and veggies are better than none at all!!! If you are buying packaged food, try to buy food with 5 ingredients or less (this is a general rule of thumb). Can you pronounce the ingredients in the food? Could you, theoretically, have these items in a kitchen? If yes, it’s Real Food. If no, it’s probably not Real Food. We love Michael Pollan’s rule “Don’t eat anything that will not eventually rot.” There are exceptions like honey, but you get the idea! Try to avoid heavily processed foods. This is food that has been taken very far from its original form. Avoid refined sweeteners such as sugar, corn syrup, cane juice and artificial sweeteners. Use sweeteners sparingly and try to use those that are nutrient dense such as maple syrup, coconut sugar, and Rapadura.